4 x 6 Name Scroll Plaques | Name Scroll Plaques | Scrolls Unlimited, Inc. These 4 x 6 "NAME Scroll Plaques" are great gift ideas for Confirmation and Communion Gifts. Each plaque displays Name, Biblical Meaning and Bible Verse. These are printed on our gray parchment paper. 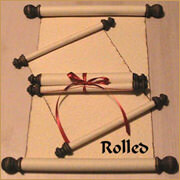 Add a tassel for hanging or display on an easel.